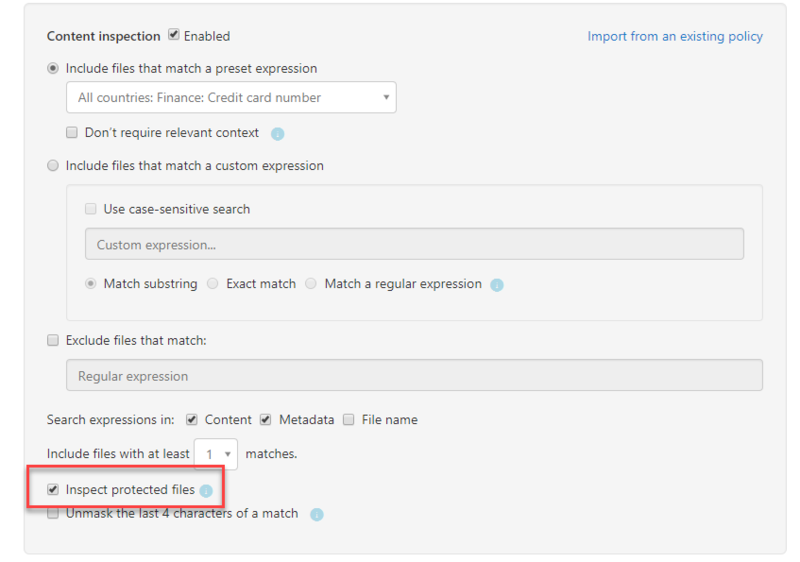 6) Under Include files that match a preset expression select pre-built expression All countries: Finance: Credit card number. There are many different pre-built expressions available under this option. 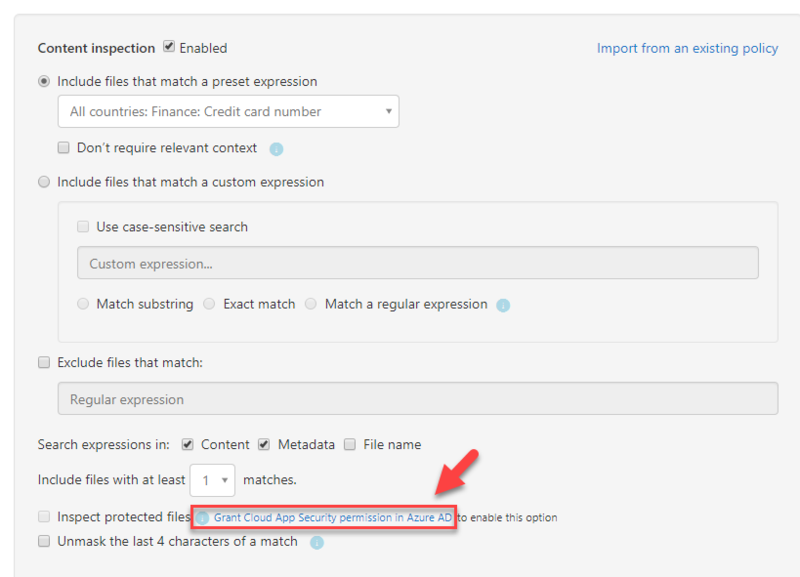 If need we also can define any custom expressions to match the requirements. 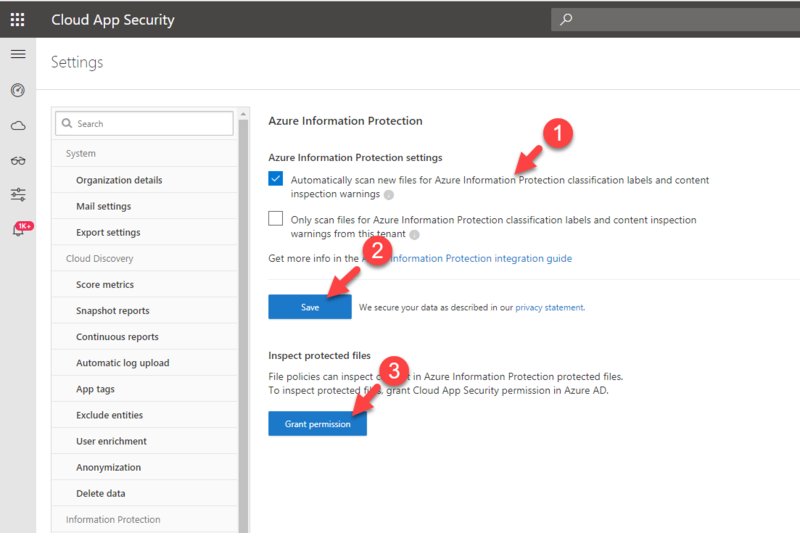 7) I also like to enable scan for Azure information protected files. 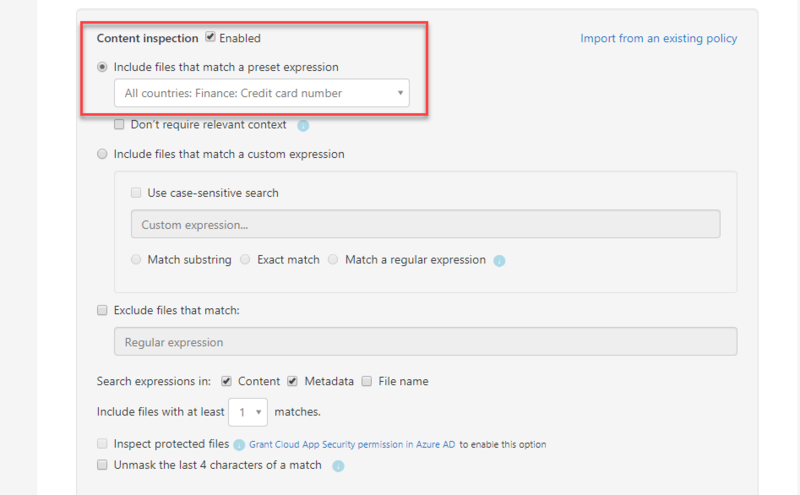 To do that I need to grant permissions in Azure AD. 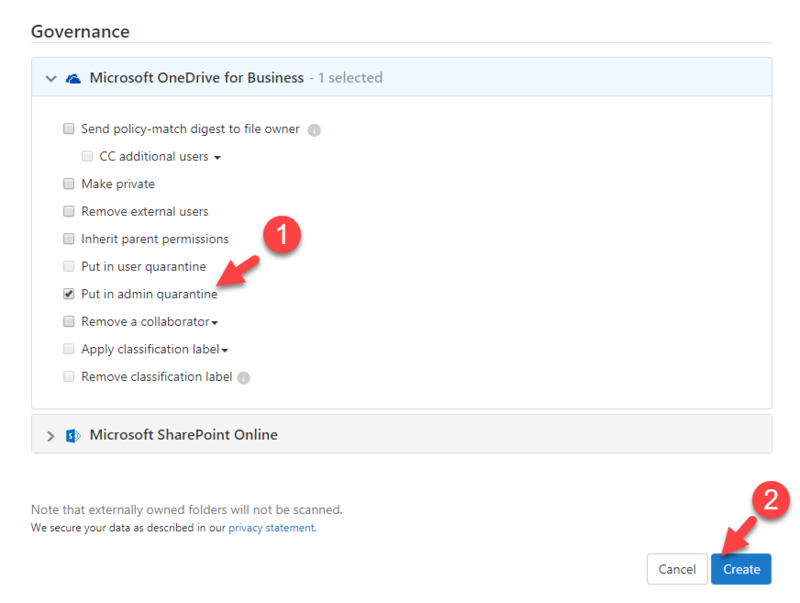 8) From the list select relevant settings you comfortable with and click on Save then Grant permissions. 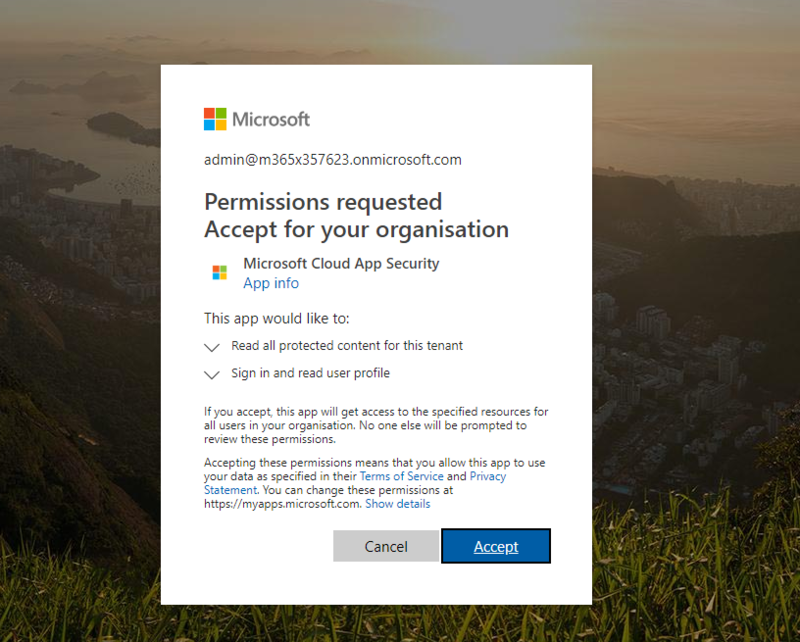 In next window, after authentication is completed click on Accept. 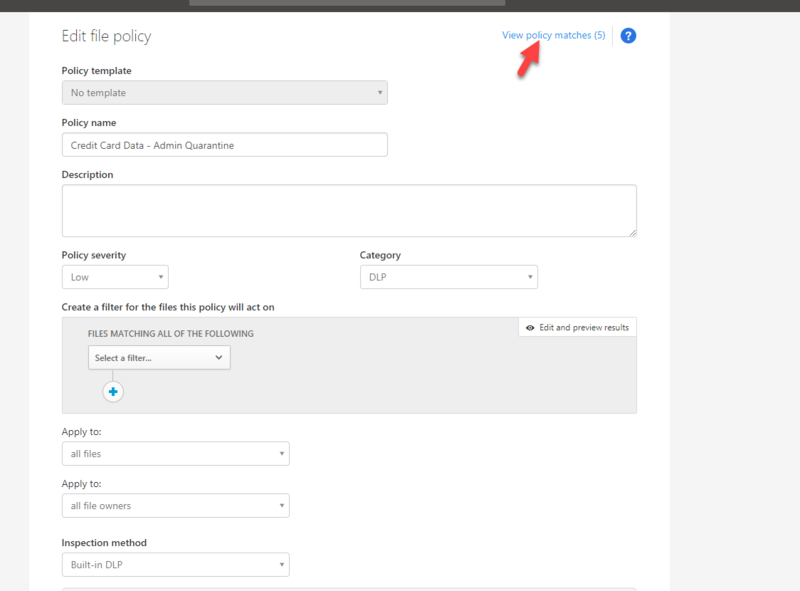 9) Then go back to policy window and select option Inspect protected files. 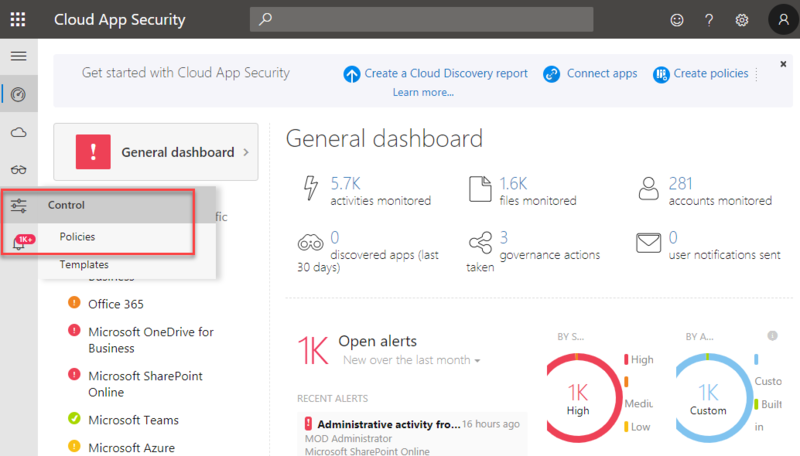 10) Under this policy I also like to receive an alert when it detects a file. 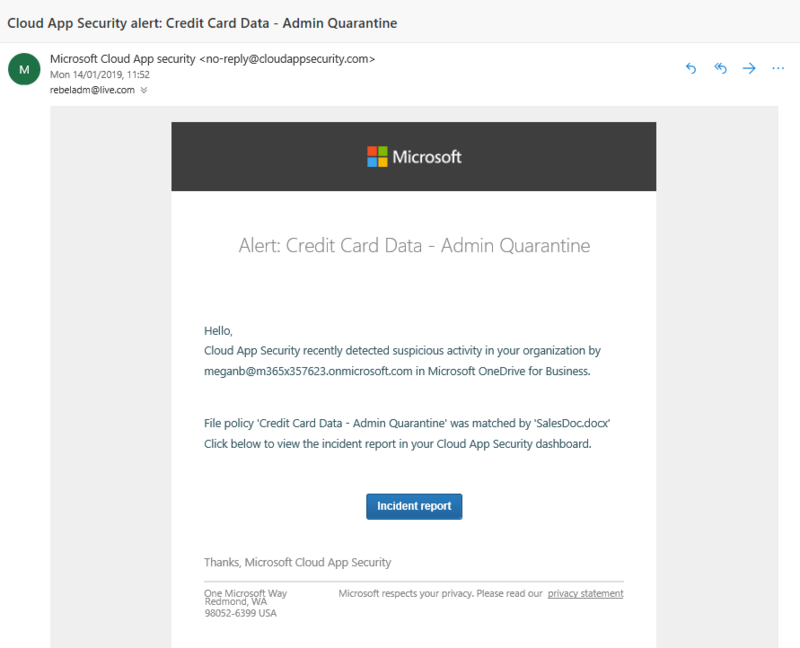 To do that click on Alerts | Send alert as email and then type the email address. 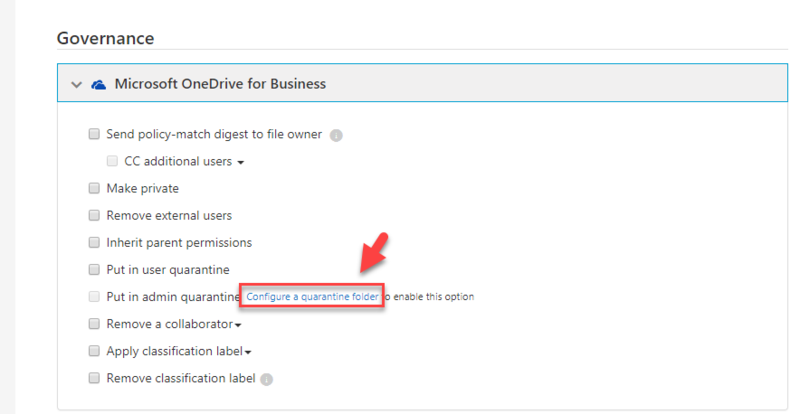 11) Then under Governance | Microsoft OneDrive for Business, click on Configure a quarantine folder link which is next to admin quarantine option. 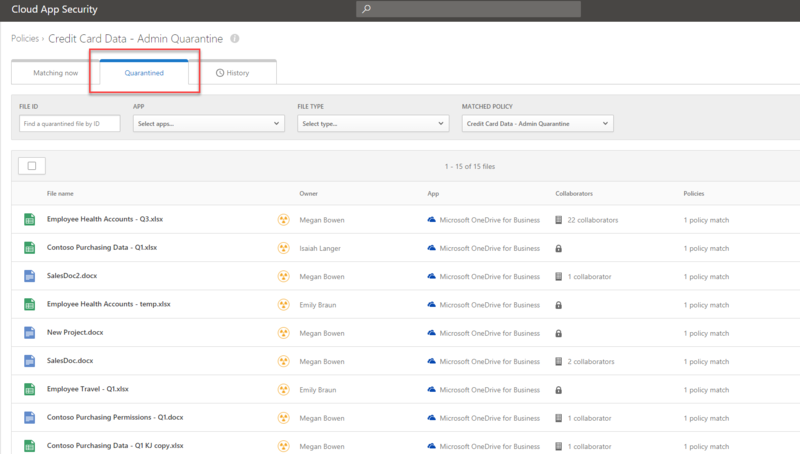 This will allow you to create the admin quarantine folder for first time. 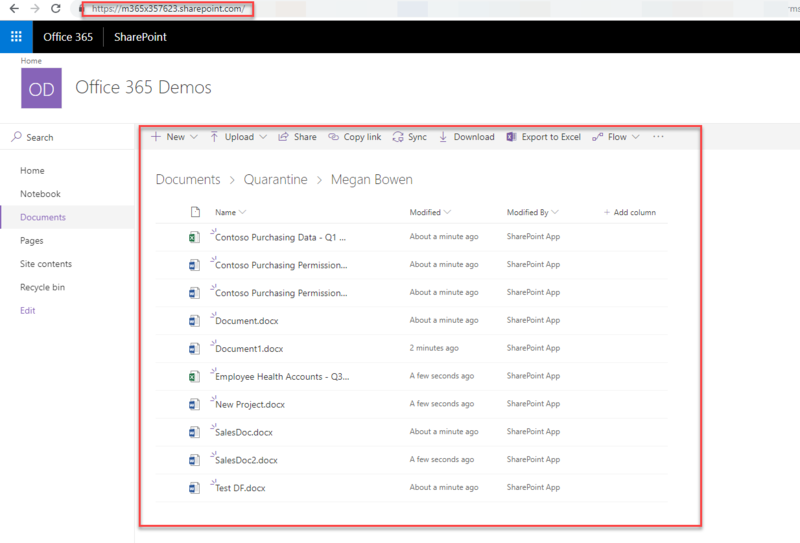 12) In new page define Admin quarantine folder path and user notification and then click on Save. 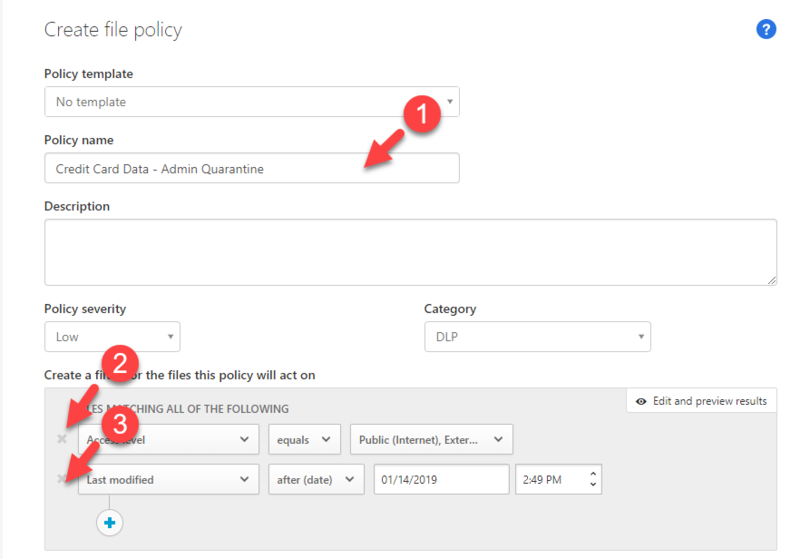 13) Then go back to policy and click on put in admin quarantine option and click on create button to finish the policy configuration. 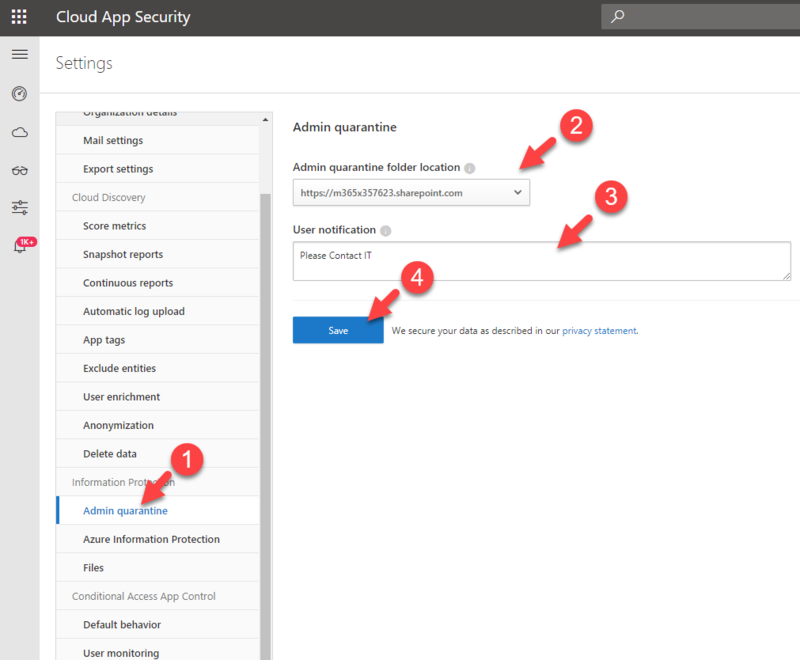 After complete the configuration, I stated to get some alerts as expected. when I go to user’s one drive, I can see the tombstone file instead of original file. 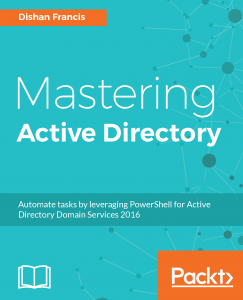 Next step is to check it under admin quarantine folder. As expected, we can see the original file under there. 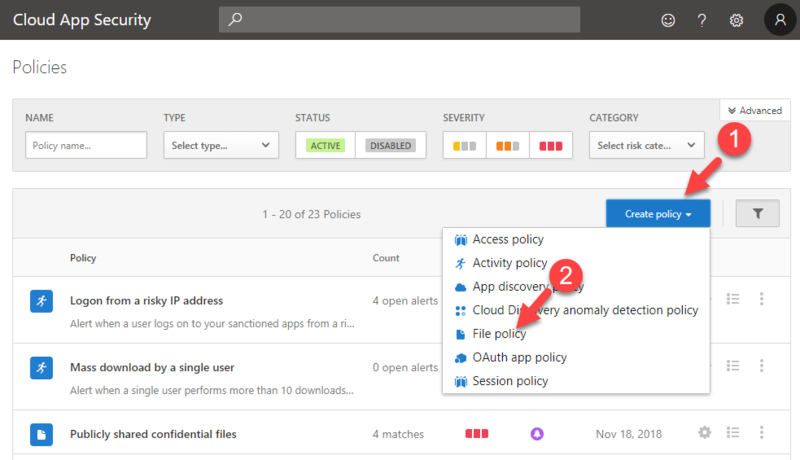 Also, If I go back to cloud app security portal and click on policy I can go and review the policy matches. As we can see it is working as expected. If you have any further questions feel free to contact me on rebeladm@live.com also follow me on twitter @rebeladm to get updates about new blog posts.